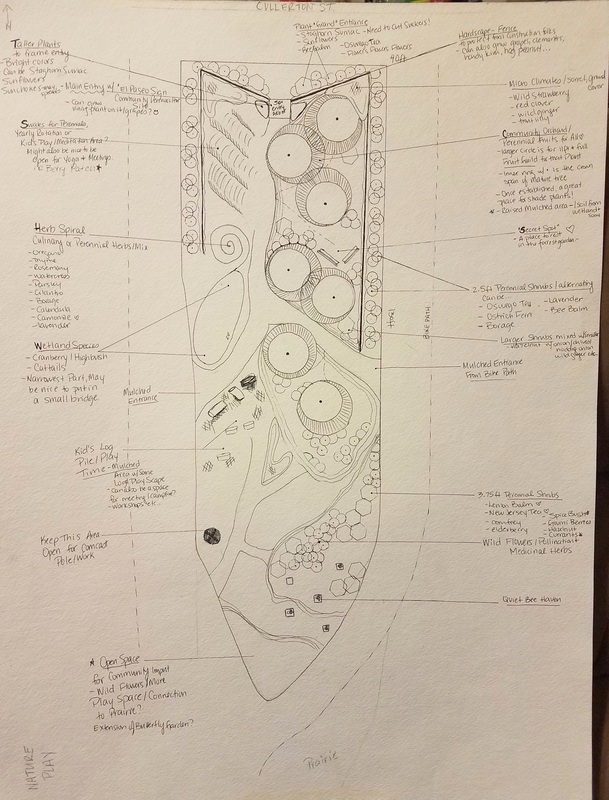 El Paseo Community Garden is working with Loveren Collections to construct a seven-layered, permaculture food forest, expand their existing prairie, install educational signage, and add butterfly and bat houses. The goal of this project is to enhance the green living space of both city dwellers and precious pollinators within the city of Chicago. Thanks to the Comed Green Region Grant, Forest Preserves of Cook County, and NeighborSpace we are able to actualize this project. Adjacent to the prairie is a site where we plan to construct a seven-layered food forest, medicinal herb spiral, small wetland area, a quiet native cove for bees and other pollinators, as well as space for community education including children’s classes and adult workshops. The site will demonstrate how we as a society and ecosystem work together in a series of permaculture principles, the first and foremost being: To take care of the earth and the earth will take care of us. The permaculture site will demonstrate the possibility of growing quality perennial food as a community while providing an array of habitat and food for pollinators, which in turn help feed us. We recognize the importance of caring and respecting biodiversity and the intricacy of a healthy ecosystem. We also recognize that without pollinators, we as humans would not be able to survive, and therefore, are in the works to educate and restore this piece of community land. The site will provide a bio diverse sanctuary for monarch butterflies, honey and native bees, numerous insects, birds, and bats. We plan to educate the community through visible signs and community workshops in herbalism, monarch and honey bee care, food preservation, seed sharing and sustainable harvest.